It was a grey and drizzly day outside, but I didn’t care, I was happy. I had the day off work to visit the Gingerman Restaurant in Norfolk Square, to check out their recently refurbed restaurant and to enjoy a delicious lunch. I skipped along the road with my umbrella, and turned down the quiet street off Western Road where the Gingerman is tucked away. Previously fronting a cream exterior, with brown and lime green seats and matching curtains, the Gingerman now has a deep, gun metal blue facade, with brown tables, an exposed brick wall and rich brown leather seating. The interior is simple, and elegant, while still feeling warming and comfortable which can sometimes be hard to achieve. The brick walls gives the place an industrial feel, while the leather seating and sleek lighting dress it up to match the level of dining and the food. We were all greeted with a glass of bubbles and I was able to have a quick chat to the owners Pamela and Ben McKellar – we discussed our family history as we have the same last name! No connections discovered though sadly, but you never know! The Gingerman was the first of their 4 current restaurants situated around Sussex, and has been open since 1998 and is still going strong. Ben left school in Brighton to study cookery at the City College, before ending up in France working in Michelin starred restaurants, and eventually coming back to Brighton to open the Gingerman – which successfully introduced relaxed, fine dining to the Brighton restaurant scene. 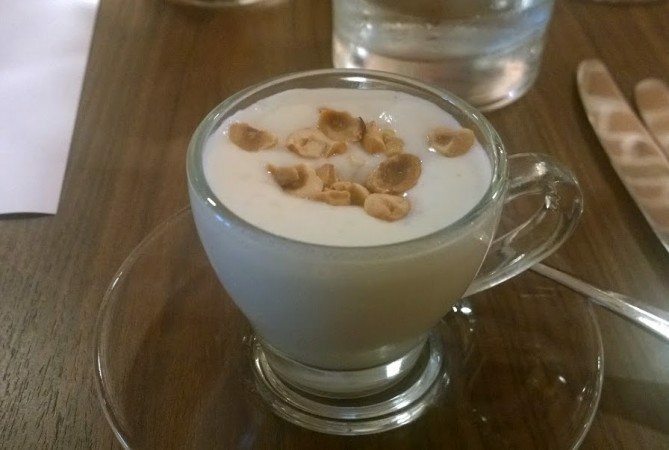 We sat down at the beautiful, copper rimmed wooden tables, and we were brought homemade bread on wooden boards, and a cauliflower veloute made with bacon and parmesan and topped with toasted peanuts. What a great combination, the texture was light and fluffy and the savoury flavours of the bacon, parmesan and toasted peanuts married together perfectly with the creaminess of the cauliflower. Now my tastebuds were tingling and I couldn’t wait for what was brought out next. The bread looked amazing too, but as I don’t eat gluten it wasn’t for me! I had a slightly different menu as mine was gluten free, but it is good to note that they were happy to adjust it for me and I really didn’t feel like I missed out. We had a set menu in front of us that contained four dishes, containing mainly locally sourced, seasonal ingredients that were matched with wines by Bibendum Wines from different regions all over the world. To start with we had sweet breads with chicken liver parfait, chou farci and mushrooms. 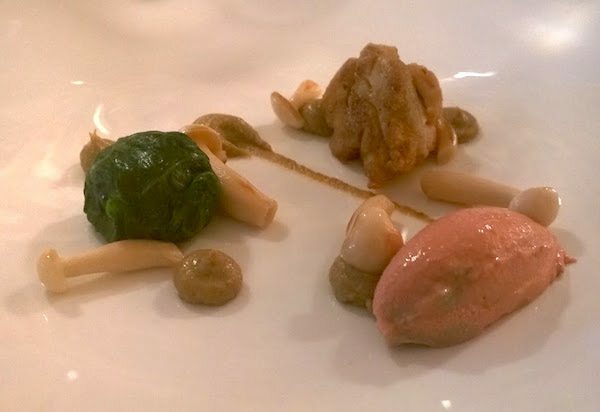 This was only the second time I had tried sweetbreads, but I really hadn’t remembered how delicious they were, soft, tender and sweet, but maybe this was because of how well they were cooked at The Gingerman on this day. The chicken liver parfait was smooth and creamy, and the chou farci (stuffed cabbage) was filled with pork and was well seasoned and packed with delicate flavours. 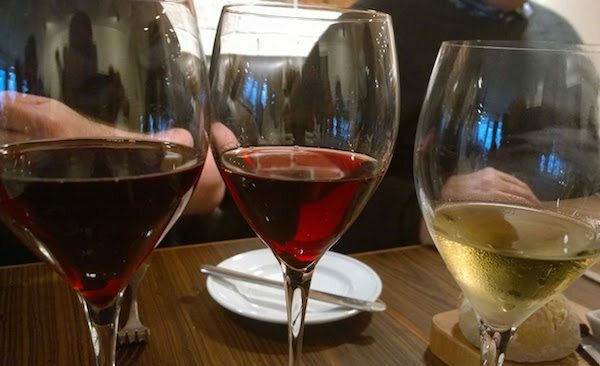 I enjoyed the slightly pickled mushrooms on the plate, and the Sicilian wine that it was served with was light and refreshing, and complimented everything well without being too overpowering on the palate. Course 2 followed shortly after, and it looked beautiful. 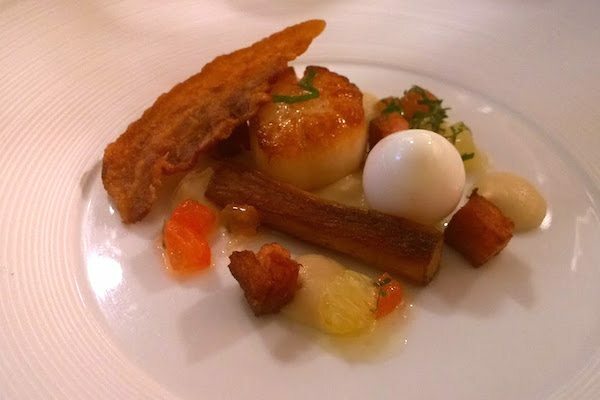 This dish included hand dived Orkney scallops that were bouncy and cooked to perfection, sweet salsify, smoked crispy bacon, and a Quail egg, with a deliciously runny yolk centre. The wine was a Viognier from NZ served at room temperature to make the most of the rich caramel and stone fruit flavours and it also brought everything together very nicely. 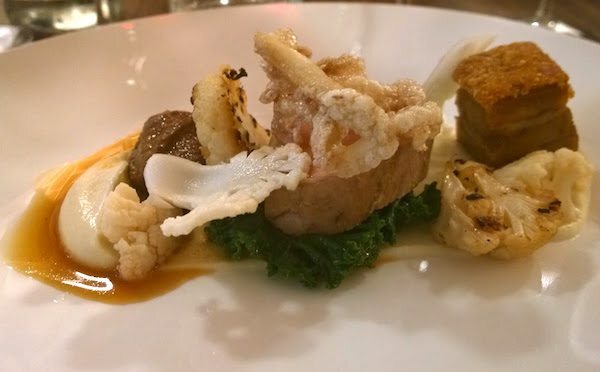 The main dish was based around pork and cauliflower, with tender pork fillet, crispy pork belly, crunchy pig ear and then cauliflower served four ways. There was pickled slices, blackened cauliflower, cauliflower puree and crunchy raw pieces too. For a cauliflower and pork lover, I was in heaven. 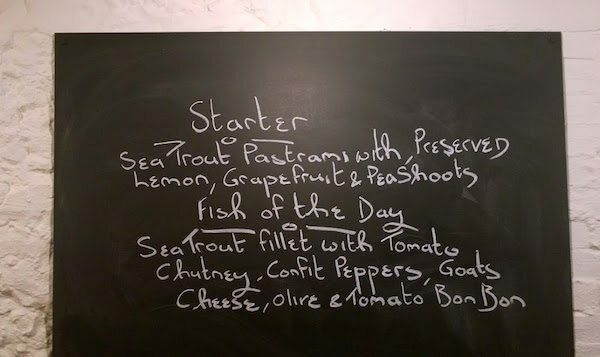 We were served 2 different pinot noirs with this dish, including the Huia, biodynamic, organic wine from Marlborough NZ, and then the Bolney Estate Pinot Noir from Sussex, just 10 miles away from Brighton. The NZ wine was rich and slightly smoky, while the Sussex wine was slightly lighter, and sweet and fruity. By now I was gulping down water, as we had had around 5 glasses of wine, but also a lot of food. Everything had been cooked so perfectly, with obvious skill, care and passion, and it’s no surprise that the Gingerman have the reputation that they have, and are still going strong after so many years. It was now time for dessert, and while everyone else was served perfectly risen souffles (I should’ve taken a pic of these! 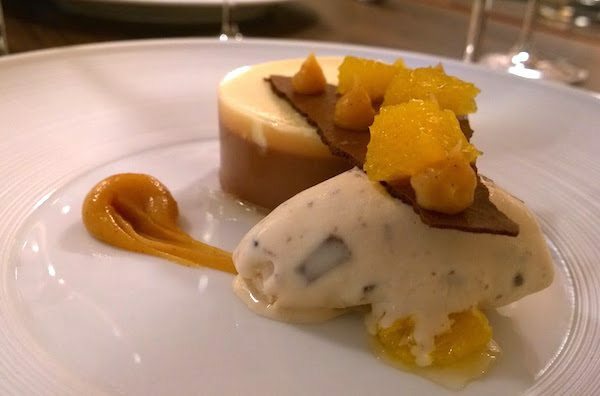 ), I was treated with a melt in your mouth chocolate delice, with orange, toffee and Baileys that was devine. There were segments of fresh orange, a creamy ice cream with chunks of chocolate, and a toffee sauce smeared across the plate. It was incredibly rich and more-ish and all the textures worked so well together, it was a very pleasant way to end the meal. 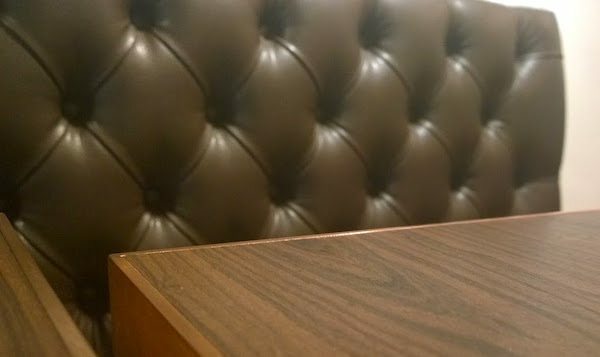 When it was time to leave, I thanked everyone and tottered out the door, feeling very full, happy, and slightly tipsy, with a new love for Gingerman and it’s swanky new look. I most definitely will be heading back there soon, either for a date night or a nice evening with the girls for an extra special treat. The prices are very reasonable – for dinner you can have 2 courses for £32, or 3 for £37, and they change their menu often, meaning you can always go there and try something new. Their lunchtime menu is also a great steal, with 2 courses for only £15! They also do Sunday lunch, with 2 courses for £20, and exciting variations of the classic Sunday meal. You really can’t fault The Gingerman, and I would highly recommend you pay it a visit soon.